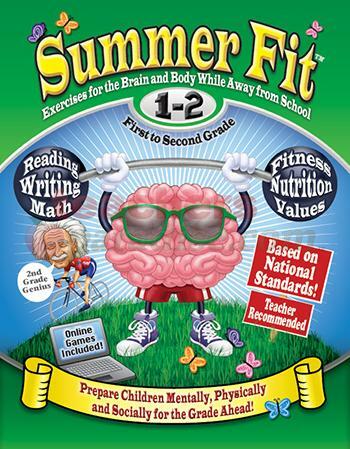 Summer Fit: Exercises for the Brain and Body While Away from School is a workout book combing learning with fitness for children in First to Second Grades. Summer Fit includes ten weeks of activities for your youngsters to learn and participate in. With skill based operations like reading, math and writing and daily exercise routine, this book is geared towards a healthier, happier lifestyle. Included are value/life exercises included for which the children to learn by, giving you a bit of history upon such great people like Mother Theresa, Princess Diana, Rosa Parks and Terry Fox, just to name a few! It includes a parent/guardian section to help you familiarize yourself with the content, such as the importance of exercise on a growing brain, developing healthy eating habits and the explanations for each exercise listed are also found. Each week is broken down with daily activities and exercises, with goal setting charts at the beginning of each chapter. Encourage your children to set a weekly goal and list three positive value things about themselves and at the end of the book, there is a certificate of congratulations for your youngster when they are finished. As well, not to get discouraged, at the back of the book you will find all the answers for the questions listed within the book! My seven year old daughter, "Not Quite Right", just adored this book, every day she stands there eagerly looking at me with book and pencil in hand. It talks to her structural self, who likes to remain on a path and stay focused, she is a child who needs a lot of structure, or her whole world falls apart, with this book, she is able to stay focused and finds it rewarding to participate. At the beginning of each day you make a choice between three exercises to do and how long you are required to do each. The explanations for some of the weirder named ones, like 'Turtle and Rabbit', are given, though we found a couple of instructions confusing, we just took the advice listed and after watching the videos at www.summerfitlearning.com, we were able to apply them correctly! At the end of each week, they give extra activities for your child to participate in! My kids loved drawing their big, scary monster faces to represent lying and have hung them in their rooms as a reminder! They giggled their heads off as they lead each other around blind-folded in a game of trust, "Not Quite Right" didn't trust her six year old brother, "Odin McBamBam" as much as he'd of liked her too, she kept peeking out to see what he was doing with her, it was quite comical to watch! I would recommend this book to any home schooling folks out there who just want to keep their wee folks tweaked and on track, as well, anyone who is concerned about the summer and they're children's progress slipping, this will keep them active and on track without too much stress. Nor will it take away from their summer holidays, each daily exercise takes about fifteen to twenty minutes to complete. We really enjoyed this book and would recommend it to everyone...my wee folks give it two thumbs up! Summer Fit is a new summer workbook series unlike any other. Summer Fit is designed to keep children mentally AND physically active while away from school using an active and values-based approach to learning. Research shows that the more children play outside the classroom, the better they perform inside the classroom. 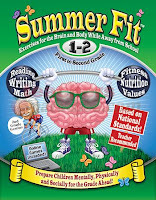 Written by some of today’s most energetic and engaged educators who strive to create “active learning environments,” Summer Fit provides grade-appropriate activities in reading, writing, math and language arts while simultaneously focusing on physical fitness, nutrition and values. Summer Fit activities and exercises are designed to prepare children mentally, physically and socially for the grade ahead.